A Quarterly Token for Juvenile Subscribers. A Gift from the Church Missionary Society. 12mo: 8 pp. Unbound. Text and illustrations complete and clear. On grubby, creased and spotted paper. 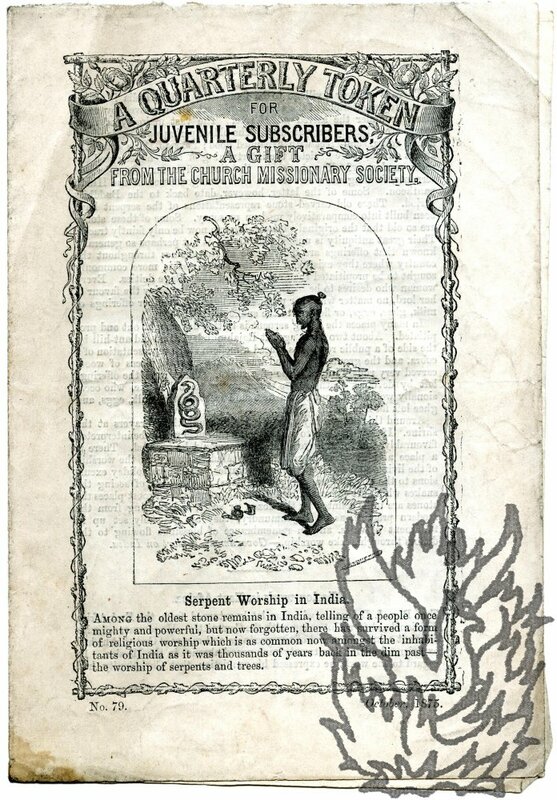 Title enclosed in a decorative border, and carries a 9.5 x 6.5 cm illustrating the article 'Serpent Worship in India'. Second article entitled 'Mission-work in East Africa.' Third article, 'Native Catechist Preaching', accompanied by a full-page illustration captioned 'West African Native Catechist Preaching'. Fourth article: 'Progress in Shaou-Hying' by the Rev. J. D. Valentine. Fifth and final article, 'Baptism and Death of a Santal Boy' ('The Rev. H. Davis gives the following account'), with half-page engraving, by 'J. Johnston', of the boy on his deathbed, surrounded by three natives and a white man in a tailcoat.